Last ditch efforts to make progress continue from the Obama administration, this time from the Department of Energy (DOE). Over the past month, Obama permanently closed most of the Arctic and Atlantic coast to drilling, and designated two more national monunments. The Interior Department finalized methane emissions regulations on public lands and created zones for solar development. Read our article, Obama Scrambles to Protect Environmental Legacy. Will we see innovations like these from Trump’s DOE Secretary? Until now, the agency has been headed by people with strong scientific backgrounds, but all Rick Perry wants to do is eliminate the Department of Energy. This long overdue initiative bolsters the manufacturing sector’s ability to reuse and recycle materials, with a goal of increasing energy efficiency 50% by 2027. The REMADE Institute in Rochester, NY, will focus on driving down the cost of technologies needed to reuse, recycle and remanufacture materials, saving billions of dollars in energy costs and improving US economic competitiveness with innovative manufacturing techniques. For decades, we’ve known that making products from recycled sources uses a fraction of the energy as making them from virgin sources, like steel and aluminum. Manufacturing accounts for 25% of US energy use. DOE has invested over $920 million in Manufacturing USA innovation hubs – matched by more than $1.87 billion from the private sector. It’s invested $100 million in Energy Frontier Research Centers. There are also Wind Energy Hubs and Climate Hubs. The overarching goal is to develop a strong manufacturing sector in the US that focuses on – and trains workers in advanced technologies that the US can lead on. The idea is to form districts of buildings where the amount of energy delivered to them is equal or less than the renewable energy they export. DOE also launched an accelerator for Zero Energy Schools, starting with six school districts in Virginia, Minnesota, Colorado and California. The goal is to develop a template that’s cost-competitive with conventional construction that can be rolled out nationwide. $40 million is set aside to build a facility to test grid-connected wave power in Newport, Oregon. Led by Oregon State University’s Northwest National Marine Renewable Energy Center, the goal is to foster development of a US wave industry with domestic manufacturing. “This facility will help us advance the science and technology of wave energy devices, and identify the challenges we need to overcome to achieve commercial deployment,” explains Franklin Orr, Under Secretary for Science and Energy at DOE. The “Pacific Marine Energy Center South Energy Test Site” would be completed by 2020, with public and private funds, if the Trump administration allows it to go forward. 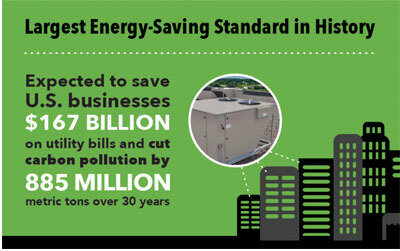 In December, DOE issued the most energy saving standards yet – for rooftop air conditioners and heat pumps, commonly used in schools, restaurants, big-box stores and small office buildings. Because they are so energy efficient, purchasers will save 4,200-$10,000 over its life. Under Obama, DOE has introduced more efficiency standards than any other president – 43 standards for refrigerators to light bulbs, that will save about $535 billion through 2030, while reducing greenhouse gas emissions significantly, they say. Take washing machines, for example. The first modest standards were released in 1991, bringing front loading washing technologies to the US for the first time. Today, after two upgrades to those standards, new washing machines use 60-70% less energy and 40-65% less water and do a better job of washing clothes. Refrigerators will consume less power than a 50-watt bulb. Remember the outrage from Republicans over switching to efficient light bulbs?! Now, LEDs are everywhere – they’ve come way down in price and are viewed as a way to save money on electricity. Manufacturers benefit as people replace electricity-guzzling incandescents with LEDs, to the tune of $16.9 billion by 2024, according to Navigant Research. And because LEDs are so efficient, using them is saving 30 power plants-worth of electricity. By 2030, efficiency will replace 96 power plants, according to NRDC. Lower electric demand also means greater health for Americans as they are exposed to less pollution from power plants. 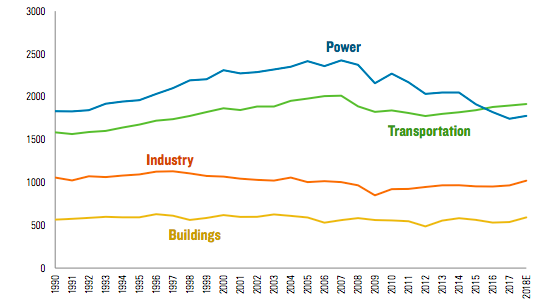 Incredibly, in 2013, the US used less energy than in 1999 even though we buy much bigger appliances, like refrigerators and TVs, and many more gadgets. By 2035, the US electric demand is decline by 14%. And these standards created 340,000 jobs in 2010 alone, according to Federal lighting and appliance efficiency standards are responsible for creating 340,000 U.S. jobs, according to the American Council for an Energy Efficient Economy (ACEEE). With the anti-regulation Trump administration, these gains are very much at risk. In February, Rep. Michael Burgess (R-TX) introduced legislation to repeal ALL efficiency standards, for the same spurious reasoning used against light bulbs – they constrain consumer choice, which could push the market toward much greater efficiency. Only fuel economy standards for cars and trucks save more energy than appliance standards, and those are also in danger under Trump.